HALOblog - Organising help for families: PRODUCT REVIEW :: Hook-over Hanger - PLUS GIVEAWAY! PRODUCT REVIEW :: Hook-over Hanger - PLUS GIVEAWAY! I first came across these hangers when I was looking for a solution for one of my clients. 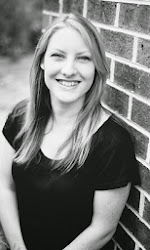 Most of you know I strongly believe that every person has a unique organising personality, and one of the most important parts of my job is to help a family full of different personalities find solutions to suit them all. This particular client had a young daughter who thought very differently to the rest of the family, and every attempt the mother made at organising her daughter's cupboard ended the same way - a pile of clothes on the floor and a frustrated young girl, feeling it was easier to find things in a pile than in her cupboard the way her mum had organised it. I worked with both of them until we found a mutually-agreeable solution, which was to arrange her clothes in outfits. 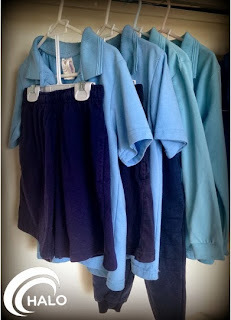 While this was not the most sensible option for the mum, she was more than happy to embrace it knowing that her 7-year old could now manage her wardrobe in a way that made sense to her, which meant no more frustration and no more piles. I then had to find the tools to make this possible - and that's when I found these hook-over hangers. What I like about these hangers is that they allow you to see and access both garments individually, while keeping them together in an outfit. If you wanted to access just the skirt for instance, you wouldn't have to reach up under the top or remove it, like you would with many other "outfit hangers" used in clothing stores. 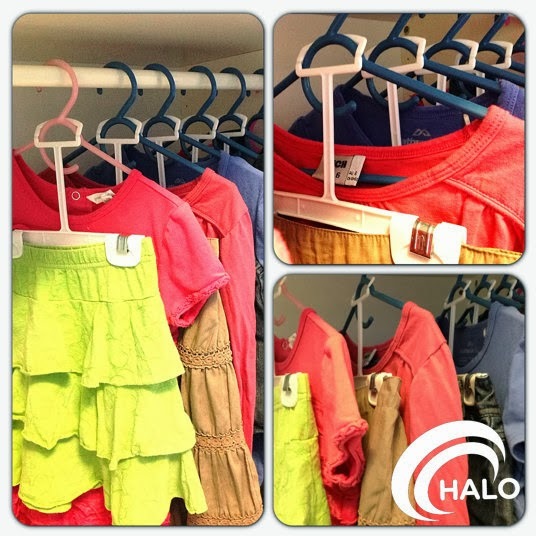 It also allows you to turn any regular hangers you have into outfit hangers. I sent a few to my client to try them out, and they all loved them so much she bought a whole bunch for her other 3 kids too! I also bought some for my son's school uniforms, and they work a treat! It's so easy to see how many days worth of uniforms we have washed and ready to go, and my son can easily grab a pre-assembled combo for the day, or select long pants and a short sleeve shirt if he prefers. Get your comments in by next Wednesday 2nd October 2013 - winner will be drawn randomly from all entries, and announced on Thursday 3rd. Good luck! Everyday I never have any Room for Clothes especially in My Son's Room Clothes are Hanging all over the Place. This will be great for my son's superman and batman pjs! I'm always looking for the other half! !